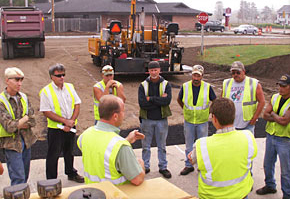 The foreman on a paving project directs crew members from start to finish. The foreman has hands-on knowledge of equipment design and operation and the asphalt laydown process. The foreman helps the crew produce the high-quality pavements that connect every corner of Wisconsin. The Asphalt Technologies Group is an AASHTO Certified AMRL Accredited Laboratory, available to perform liquid asphalt testing services for all members of the asphalt industry. From refiners to contractors, we are able to meet all of your testing needs on Performance Graded Binders, Emulsified Asphalts, Polymer Modified Asphalts, Aggregates, Penetration Graded Asphalts, and Viscosity Graded Asphalts. Our Full Service Laboratory can set up testing programs to meet your individual needs. Contact us today to learn more about how we can provide you with high quality testing services at affordable prices.